Hanoi (VNA) – The Hanoi People’s Court on March 18 sentenced three people to death and one to life imprisonment for drug trafficking by air. The death penalty was given to Vu Thi Thu Hoai, 47 years old, Vu Thi Hai Yen, 24 years old and Le Trung Thanh, 40 years old, all from the northern port city of Hai Phong. 42-year-old Pham Thi Hop, also from Hai Phong city, was sentenced to life imprisonment because she has a child, who is under 36 months old. According to the indictment, at midnight on June 20, 2017, anti-drug police of the Ministry of Public Security and security centre of Noi Bai International Airport found methamphetamine hidden in a dozen green dragon fruits in Yen’s hand luggage. Investigations showed that in the middle of June 2017, Hop agreed to transport crystal meth from Ho Chi Minh City to Hai Phong. As Hop was taking care of her baby, she asked Hoai to go. Hoai then asked Yen to go together. 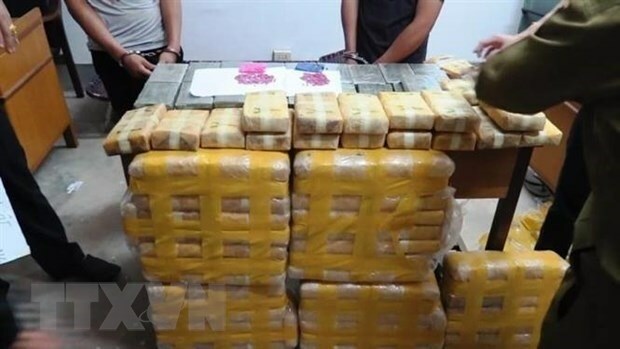 Hoai and Yen were arrested when carrying over 2.6 kg of drugs.